Garage door remote controls are handy and ubiquitous. They are the "key" that many of us use to get in and out of our houses. They cause few troubles, are easy to fix when they do, and can be replaced at little expense. But what, exactly, should you do when your remote control button fails to perform its duty? Or where do you look when you need a replacement for the remote? Or when should you consider replacing the whole garage door opener? Good questions all. Here are some answers to questions about repair, replacement and upgrading your garage door remote. Garage Door Remote Not Working? When the wall-mounted button works but the remote does not, you probably need to either reprogram the remote or replace the battery. The best way to go about reprogramming the remote is to check the manual for instructions. If you don't have a manual, you can probably find on the manufacturer's Web site. Most basic garage door openers require just a few simple steps to program. Typically, you hold down the open button on the remote while pressing and releasing the programming button, then release the open button when the garage door opener light comes on. If you have a HomeLink garage door opener, here are programming instructions. If these steps aren't working, or if you would just rather let a pro tackle the job, see How To Find the Best Garage Door Installers and Repairmen for suggestions. There are some problems with garage door remotes that seem to defy solutions. Sometimes people discover that their garage door will open on its own. You might be sitting in the living room, or away at work, and the door suddenly opens. The reason for some of these strange occurrences may surprise you. It seems that the government (at any level) can use the same radio frequencies as garage door remotes for emergency purposes. In the process of using that frequency in an area, garage door openers nearby can be inadvertently opened at will. See below for information on replacing garage door remote batteries. Yes, there is an app for that. At least there is at the moment for the iPhone. I have no doubt that apps will soon be available for other smartphone operating systems that allow you to open and close your remote with your phone. Very convenient, but make sure not to lose the phone. Strange as it seems, many people forget that they only thing powering their garage door remote is a battery or two inside. When the remote seems to stop working suddenly, the first thing to check is the battery or batteries. To do so, you will need to remove a small screw or two on the remote and then pry it apart. If your remote does not have screws, you should be able to access the battery by sliding the panel on the back. Remove the battery or batteries. If your remote uses AA or AAA batteries, you probably have fresh ones lying around the house. Smaller, round batteries may require a trip to a battery store or electronics store. Replace the batteries and reassemble the remote. Many people enter their houses most often through the garage, not the front door. Why? Because it's more convenient. You turn into the driveway, hit a button on the remote, park in the garage, then enter the house through the entry door in the garage. Convenience is nice, but sometimes it can backfire. As it turns out, burglars happen to like entering houses through the garage, too. Why? Because it is often much more convenient. This is especially true when you leave a remote in a car parked in the driveway or on the street, and even more so when that car is unlocked. Once the bad guy gets his hands on your remote, he's just one click of a button away from getting into the house. For some broader suggestions on safety, security and garage door openers, see Garage Door Openers and Garage Security. Kids love to play with anything with a button that, when hit, makes something happen. Garage door remotes fit that definition. Yes, it's fun, but it is also dangerous. To minimize the dangers that garage door remotes pose to children, the International Door Association has put together a simple safety program called D.O.O.R. Safe. Check out the advice, and establish a habit in your household that children are not allowed to play with garage door openers. If you've lost or broken a remote, it is very easy to find a replacement. Contact the manufacturer of the garage door opener, or shop online for a replacement. You will need the model number of your opener. 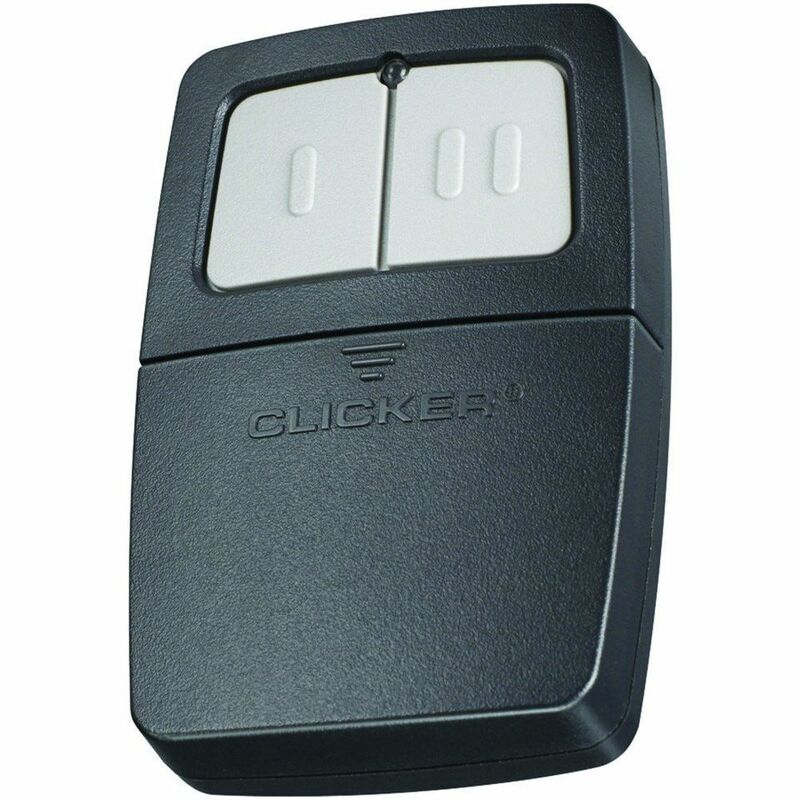 Alternatively, you could consider picking up a universal garage door remote (see below). Skylink and others manufacturer garage door remotes that can be programmed to operate most garage door openers. These remotes are inexpensive and easy to find online and in stores. The manufacturers of garage door openers do not particularly like the manufacturers of universal remotes. One of the former, Chamberlain, actually sued Skylink in an effort to keep them from selling their universal remote in the United States. Chamberlain maintained that the universal remote was a security threat, but it seems that what they really meant was that it was a profit threat. The courts did not support Chamberlain's effort. There's no reason to let a problematic remote compel you to replace the whole garage door opener. Remotes can be repaired and replaced. That said, there are many good reasons to replace the garage door opener. Security and safety are at the top of the list. Early models of garage door openers could be opened with remotes in the hands of burglars patrolling the streets. Newer openers have codes that are much harder to duplicate.